Now there`s a multi-purpose disinfecting solution (MPDS) that delivers peroxide-quality disinfection with MPDS convenience. COMPLETE® RevitaLens MPDS cleans, rinses, disinfects, stores, removes surface deposits, including lipids and proteins, and re-wets silicone hydrogel and other soft contact lenses. In testing RevitaLens demonstrated that it could remove up to 99.99% of microbes from the lens surface, as well as removing on average more than 85% of protein and lipid deposits from the surface of the lens. After use Complete RevitaLens Multi-Purpose Disinfecting solution has been proven to provide comfortable contact lens wear for up to 16 hours a day, with exceptional clarity. Contact lens wearers that have tried Complete RevitaLens have reported exceptional levels of comfort over a 90 day wearing period. Keeping your contact lenses clean and hygienic is essential for a successful lens wearing experience. 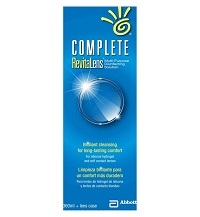 COMPLETE® RevitaLens MPDS will help you achieve a healthy contact lens wearing experience. COMPLETE® RevitaLens Multi-Purpose Disinfecting Solution cleans, rinses, disinfects, stores, removes surface deposits, including lipids and proteins, and re-wets soft contact lenses. • 3 x 240ml bottle of RevitaLens Multi-Purpose Disinfecting Solution. • 3 x lens case. Read and retain the leaflet for a full list of precautions and instructions for use. • Do not use if tamper evident seal is broken or missing. • Do not rinse your lenses or lens case with tap water. Alexidine 0.00016%, Polyquaternum-1 0.0003%, Boric acid, Sodium borate decahydrate, Tetronic 904, edetate disodium (EDTA), Trisodium citrate dihydrate, Sodium chloride and Purified water. Be the first to write an online review of Complete Revitalens Multi Purpose Solution 3 Pack and share your thoughts on this product with other shoppers!